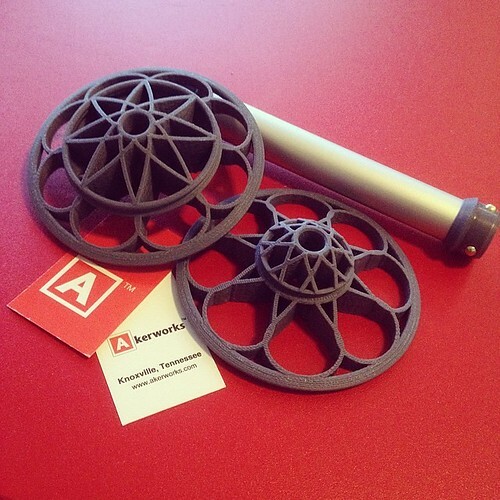 I’ve been super lucky in that I was able to give this lovely 3-d printed flat-pack bobbin from Akerworks a test run before they were released to production. Adan did a good job matching up measurements with the stock bobbins from Schacht. Here they are side by side. 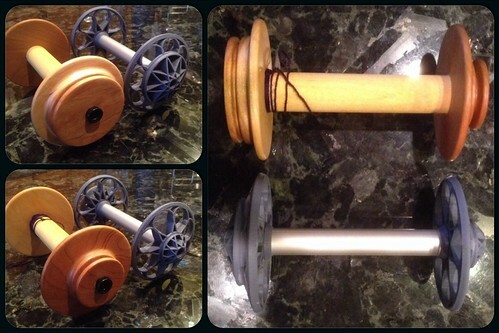 While it may look like the whorls are slightly smaller on the 3-D bobbin, the measurements seem to match up quite well with the deep grooves in the wooden bobbins. 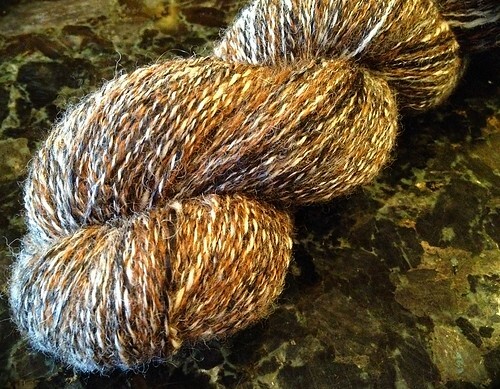 I opted to test my bobbin spinning on this lovely pile of Alpaca. 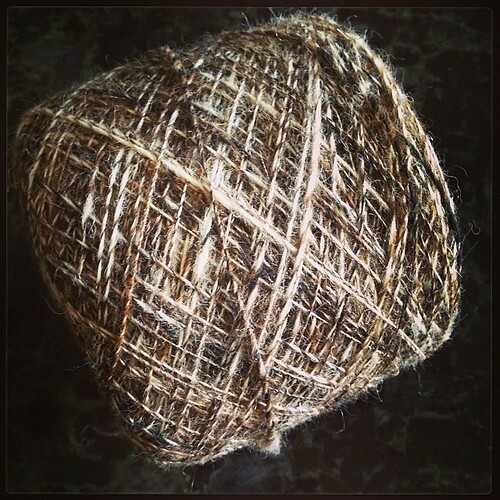 It was also a chance for me to practice Combo-drafting – the fiber was made up of 3 colors of alpaca – basically as if someone had prepped the ecru, brown and black fibers separately then grabbed the end of each of them and wound them into this bump. 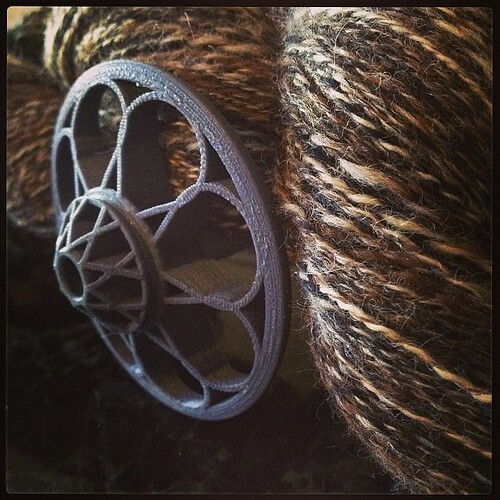 The idea with combo-drafting is to evenly draft the fiber so that the resulting single looks almost like a 3-ply in that it should barberpole all three colors together. It spins beautifully – I did all my testing in double drive, which is my preferred setup for my wheel. 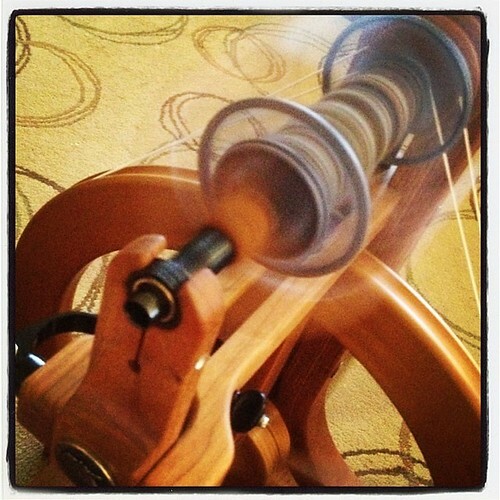 Takeup seems to be stronger on the Akerworks 3-d bobbin when compared to the stock wooden bobbin from Schacht – for me, this is a good thing since I typically struggle with getting a full 4-ounce bump worth of fiber onto my stock bobbins. One of the things I really love with these bobbins is the cutouts – I can easily see how the bobbin is filling up, and it’s also just interesting to watch the singles wind on, making stacks of color. 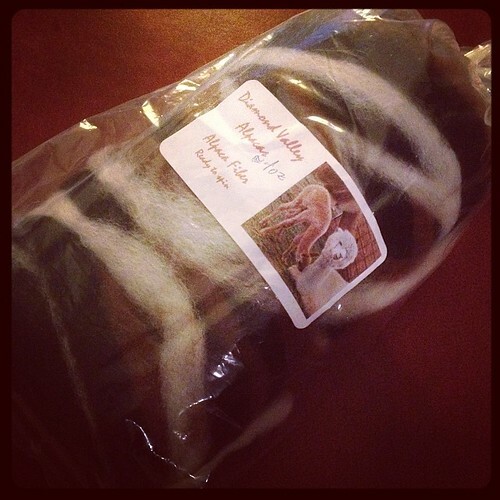 It isn’t so obvious in this photo since the yarn in question is so heathered….I’m happy to report that I was able to get the full four ounces of alpaca onto that bobbin with a bit of room to spare! My combo drafting skills are not as great as they could be, though I admit I love how the singles looked when I wound them off into a cake for plying. Looks like a big toasty marshmallow with all the colors of caramelized sugar! I’ll finish off with a few glamor shots. I have to say I really enjoyed spinning with the Akerworks Flat-Pack bobbin – so much so that I’m planning on replacing all of my bobbins with these. They do have the added bonus of being very photogenic, and they show off the singles rather nicely. Akerworks is a small family run business – Adan, the proprietor, is working on expanding the line of wheels his bobbins are compatible with. 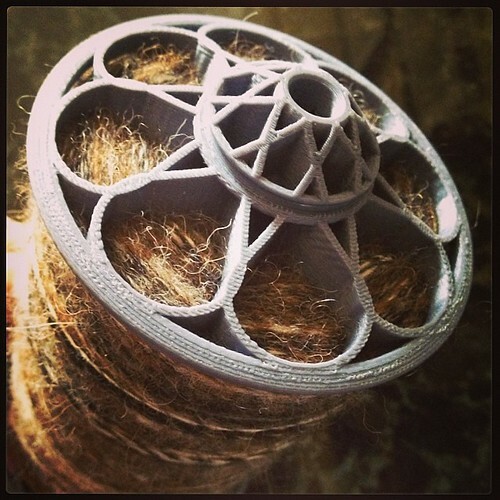 Note that bobbins are printed to order and there may be a bit of a lead time as 3-d printing can be a bit slow….but I can tell you, the wait is worth it. At least I think so!